Microsoft Corporation (NASDAQ:MSFT) stock has nearly doubled since February 2014, when Satya Nadella succeeded Steve Ballmer as CEO. Ballmer, a friend of Bill Gates who joined Microsoft in 1980, emphasized hardware and the cloud, introducing the Windows Phone and the Surface tablet. However, Ballmer famously underestimated Apple Inc. (NASDAQ:AAPL) and its iPhone in 2007. As computing underwent a platform shift, going from desktop to mobile, Windows fell behind Apple and Alphabet Inc (NASDAQ:GOOGL, NASDAQ:GOOG), and their iOS and Android operating systems. Ballmer then doubled down, buying the mobile phone division of Nokia Oyj (ADR) (NYSE:NOK) in 2013. But it was too late. Android and iOS had won the mobile war. Under Nadella, Microsoft dialed back on hardware, writing off $7.6 billion from the Nokia deal and cutting 7,800 jobs. But Nadella continued to focus on the cloud, with Microsoft Azure growing faster than its competitors, Google Cloud and Amazon.com, Inc.’s (NASDAQ:AMZN) AWS. FAAMG serves as a useful acronym, but sometimes we forget the differences between these different tech giants. Some technology companies deal primarily with individual consumers, while others mostly deal with businesses, and some with a mix of the two. Facebook, Alphabet, Apple and Amazon are all very customer-facing firms; we deal with them every day, and most people have a general idea of what they do. But people generally know less about technology companies primarily serving other businesses, such as International Business Machines Corp. (NYSE:IBM) and Oracle Corporation (NYSE:ORCL). These companies provide software and cloud services to companies to help day-to-day operations run smoothly. They sell special software for things like enterprise resource planning (ERP), customer relationship management (CRM) and database management. To a greater extent than its peers, Microsoft straddles both worlds, enterprise and consumer. It likes it that way. In a 2014 interview, Ballmer stated that Microsoft doesn’t want to be an IBM, selling mostly to businesses but not to consumers, or an Apple, selling mostly to consumers but little to businesses. I see Microsoft as a hybrid of the two, and the most business-focused of the five top tech firms. In 2013, MSFT earned 55% of its revenue from the enterprise customer segment. 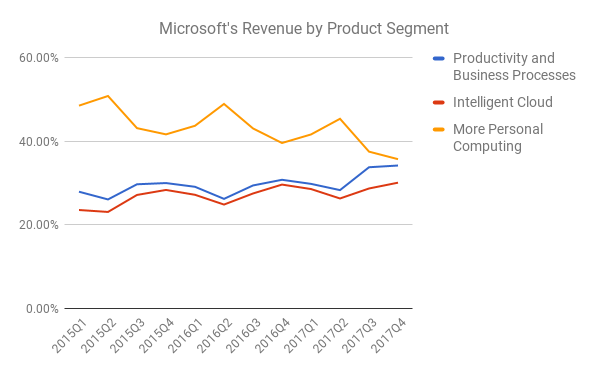 I couldn’t find revenue by customer segment in more recent annual and quarterly Microsoft reports, but we can look at the company’s different product segments and their most likely users. 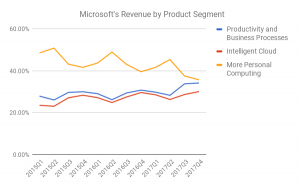 Microsoft reports its revenue in three main product segments. More Personal Computing: This includes the Windows operating system, devices such as the Surface Pro, gaming and advertising. This segment accounted for 43.97% of Microsoft’s non-GAAP revenue in 2016, 40.11% in 2017 and 35.71% in the most recent quarter. As you might guess, this involves individual consumers more than businesses. Intelligent Cloud: This segment includes things like Azure, Microsoft SQL Server and Windows Server, as well as consulting services. 27.23% of non-GAAP revenue came from this segment in 2016 and 28.39% in 2017. Consumers like you and I may use things like Windows and the Surface Pro, but we generally don’t buy or rent our own servers. Microsoft put revenue from its Office and Dynamics software in the final segment, Productivity and Business Processes. This segment accounted for 28.8% of non-GAAP revenue in 2016, 31.5% in 2017 and 34.19% in the most recent quarter. Not all this revenue comes from businesses, since Office 365 includes both Commercial and Consumer versions. However, MSFT earned more revenue from Office 365 Commercial than Office 365 Consumer. And who uses CRM software? Mostly businesses. Microsoft’s More Personal Computing segment appears to be shrinking as a share of total revenue. This suggests that while Microsoft may still be a hybrid of Apple and IBM, it’s gradually becoming less like the former and more like the latter. This isn’t entirely new, and it was noted in a 2014 article. Microsoft, along with Salesforce.com, Inc. (NYSE:CRM), leads in the enterprise software-as-a-service (SaaS) market. Office Commercial and Dynamics CRM are some of the company’s fastest-growing revenue streams next to Azure. BrandZ named MSFT the world’s most valuable business-to-business (B2B) brand last year. BrandZ gave MSFT a B2B brand value of over $121 billion, ahead of second-place IBM with $86.2 billion. Microsoft’s acquisition of LinkedIn, the world’s largest professional network, will probably increase its focus on the business segment. 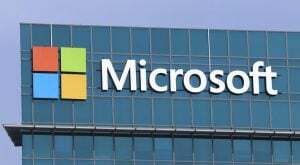 Article printed from InvestorPlace Media, https://investorplace.com/2017/08/microsoft-corporation-msft-stock-hybrid-strength/.